"Diving into The Halo Universe with A Side of Strategy"
Earlier in the first quarter I made the most of the opportunity to play the Halo Wars 2 blitz mode multiplayer beta for PC. Though a new feature, it highlighted key weaknesses that I presently conclude to be inherent within RTS games for console. With controls optimized for gamepad as opposed to keyboard and mouse, players find themselves hamstrung. The tools for success in Halo Wars 2 likewise want for much. Because of this, the campaign suffers from chronic handholding; many veteran RTS players will complain of a dumbed-down, step-by-step process. Objectives micromanage each step a player takes and hinders creative problem solving. The narration in the game, and even the content of the cutscenes take precedence over player actions. This results in a disjointed perception for players seeking a sense of accomplishment. Though story-driven to an extent that fills the universe of Halo, players themselves starve for good gameplay. I attribute much of these issues to the goals of Halo Wars 2 itself; it's designed primarily for Xbox One, not PC. As a result, console players looking for an entry to the RTS genre will enjoy this game: others, not so much. But for all of its shortcomings as a RTS game, Creative Assembly singlehandedly provided what two past installments of Halo could not: Halo Wars 2 definitively feels like a Halo game. The familiar sight of Spartan IIs, more specifically Red Team, make a return. In Halo Wars 2, the members that comprise this legendary squad enjoy a more fleshed out personality, and individual quirks that set them apart. Units in general posses diverse dialogue when compared to the first Halo Wars. They face a giant and imposing enemy in every sense of the word, and the UNSC's continuing struggle against the Banished highlight a return to the sophistication of the lore of Halo. Very little in recent memory comes close to the quality of story that Halo Wars 2 features. [caption id="" align="alignnone" width="1080"] Red Team reprises as central protagonists in Halo Wars 2[/caption] Partly because of its reprising characters and factions, the game's enjoys a fluid continuation of the series. Continuing the struggle between the UNSC and the Covenant over Forerunner monoliths, players find themselves at home in a familiar battleground. The Ark from Halo 3, having survived the premature firing of the Halo it manufactured, becomes the home of a former Covenant offshoot that dreams of galactic conquest. Between them and the realization of that dream stands the Spirit of Fire and its crew. Ready guns. The player themselves serve more as a tactical officer. Never mentioned or directly addressed, the player seeks to accomplish specific objectives that develop with the plot. Though at times a little ham-fisted and fourth-wall breaking, the protagonists advise players on general strategy. They outline objectives to accomplish, emphasize a particular unit or role, and at the beginning force players to follow a predetermined path to victory. As the campaign progresses, players are given varying levels of freedom with units and strategies. Missions are often used as opportunities for players to become familiar with a particular type of unit or circumstance. As a result, players learn to adapt different strategies and units for success. In a purely functional sense, the campaign of Halo Wars 2 acts as a primer for its multiplayer modes. But beyond teaching the player new things, the campaign also served as a platform for filling in the universe besides the adventures of John-117. 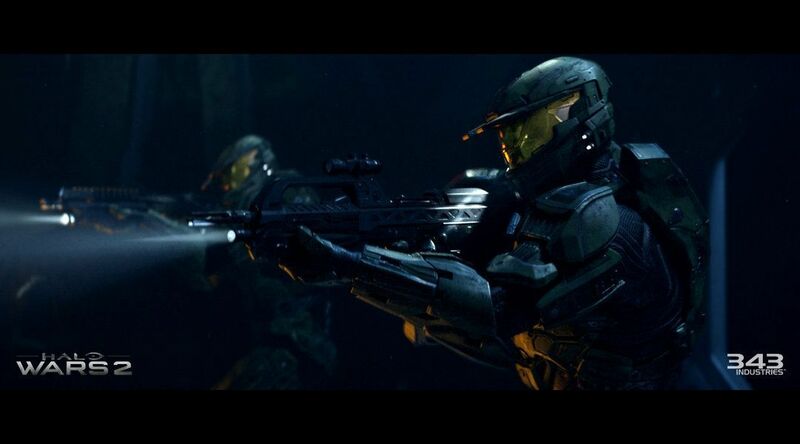 The ending also seemed to hint at a greater tie-in between the storylines of Halo Wars and the flagship series. This raises interesting implications for the future involvement of Red Team, one of the few Spartan IIs to survive after the war. The Banished may also very well play an expanded role within the Halo Universe as the overall plot develops, an intriguing proposition to any Halo fan. 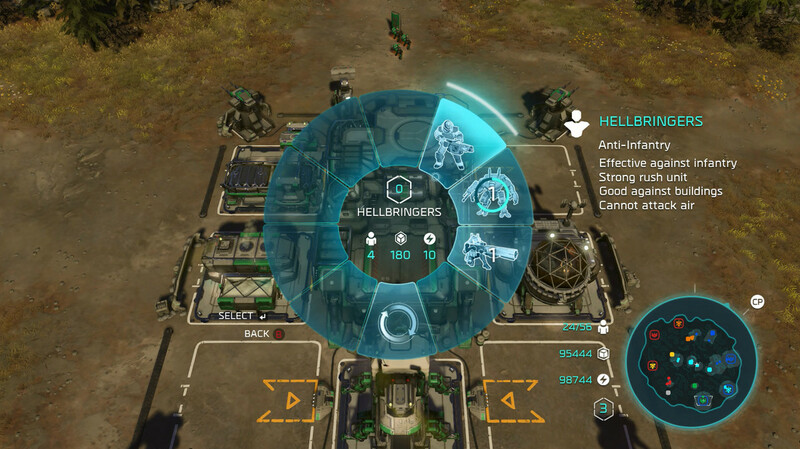 Halo Wars 2 builds upon the precedents set by the first Halo Wars's radial menu. It carries much of the same strengths and weaknesses, being easy to access and select buildings and upgrades from simple gamepad inputs but clunky compared to the controls of PC RTS games. To Halo Wars 2's credit, the game comes with assignable hotkeys to improve multitasking and APM, but players still cannot multitask between base development and unit micromanagement. In gameplay this translates to hamstrung responses to multi-front attacks, and a lack of options when countering an opponent. Control groups exist only for units, forcing players to focus either on the home front or front lines. [caption id="" align="alignnone" width="1200"] The radial menu makes its return. Multitasking and high APMs are not to be expected[/caption] Again, controls designed for consoles do not utilize the potential for keyboard and mouse. This becomes especially prevalent in RTS games, where sophisticated controls for multitasking become essential factors for success. Though simplistic, Halo Wars 2 still accomplishes its attempt to bring strategy games to console. It limits its appeal mostly to this platform, but it shows creative solutions from a studio that just inherited the IP from Ensemble Studios. If you play consoles and/or are a general fan of Halo, yes. I enjoy this game for its story first and foremost. The gameplay remains as Halo Wars 2's primary drawback, and a big one at that. To many, games do not simply serve as a medium for storytelling; movies do that already. Under that standard, Halo Wars 2 falls several controls short of a good game. But what it lacks in gameplay it makes up for with an excellently weaved narrative. Creative Assembly exceeded my expectations for integrating Halo Wars 2 into a franchise they had no prior experience with. It delivered a more compelling narrative than Ensemble's precedent, and partly addressed the issues that made the first Halo Wars flat-footed in gameplay. Though Halo Wars 2 hardly expands a niche audience, it nevertheless improves what fans of the first Halo Wars enjoyed.